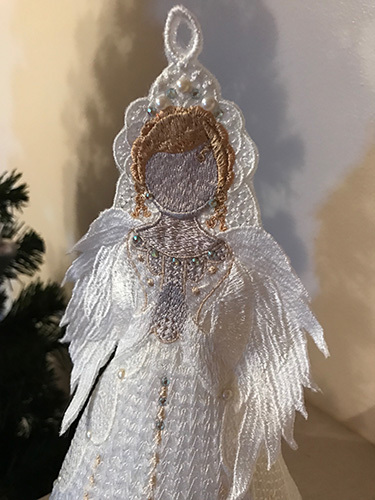 I have taken the Celtic angel and created two new angels for you, one with a red and white theme with butterfly wings and another with a snow theme and feathered wings. 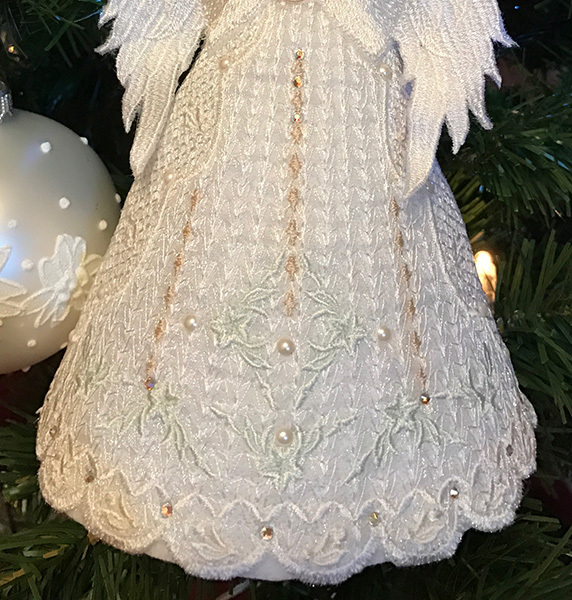 Both wings come in two sizes and as before your angel can be flat or can be given a skirt that will allow her to sit on top of the tree. The angels are the same size as the Celtic angel so some designs are interchangeable. You can decide which wings to use and which skirt to embroider. The body of each angel is the same, with a piped top and sleeves, and hands in prayer. 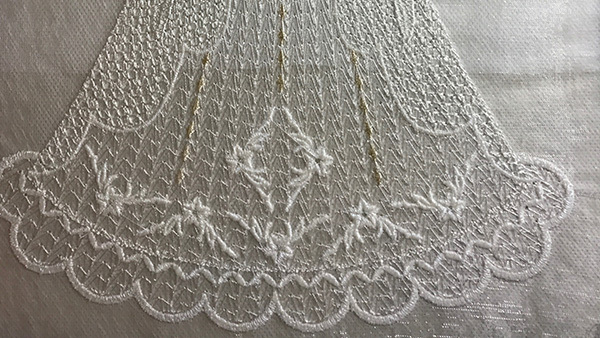 As these are not free standing lace, you need to embroider the designs out on sheer fabric like organza, using water soluble stabiliser or no show mesh if you do not want to wash the designs out. Use white and off white threads for the snow version. I did embroider one of my test stitch outs with metallic thread but I advise you to be careful as the details never quite seem to pop in the same way when I use it. When your embroidery designs are finished, trim the jump stitches and carefully cut around the edges to about ⅛” away from the stitches. A little fabric extending out from the designs does not spoil them at all. I do this under my magnifying glass/lamp and find it much more successful. After completing my “snow” angel, I inserted a semi circle of Floriani stitch n shape under the skirt. This holds the angel up allowing her to sit on top of your Christmas tree, or as part of a display with greenery and candles. 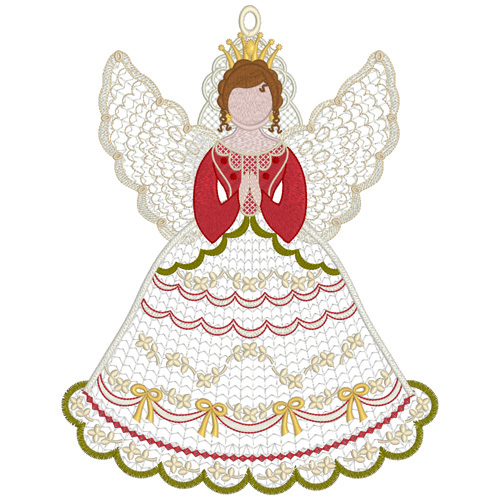 If you just embroider out the body and wings, this flat angel can be used as a tree decoration, a napkin holder, a gift tag or in festive bunting. Decorate your angels with small hot fix crystals and pearls so she catches the lights around her. I find it so much easier to place my pearl or crystal where I want it to be, and then place my hot fix applicator over the crystal and slowly apply pressure to the count of around twelve. It is possible to move crystals that are slightly out of line, by holding the heated applicator over the crystal again to melt the glue again for a while and then slowly move it. However it is best not to go further than its diameter, as the deposit of glue may show. 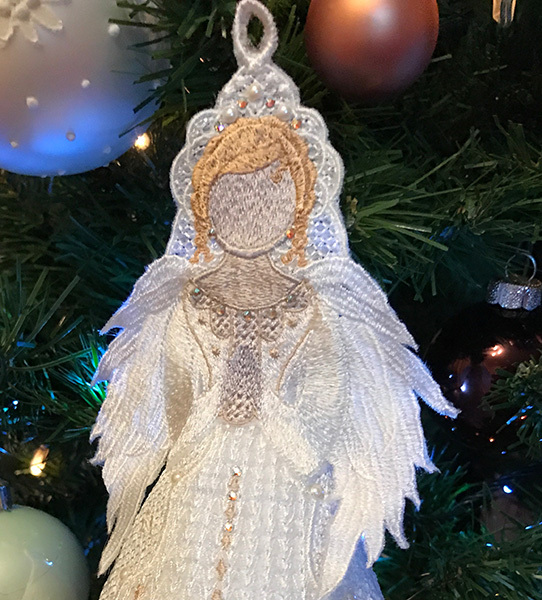 There will be an update on these Christmas angels in 2017, when I will introduce more features and options for personalising them. In the meantime these angels will be released today! Happy Christmas to you and thank you so much for following my blog. All the best for 2017. This entry was posted in Embroidery projects, New Designs and tagged 3 Dimensional embroidery, Christmas, machine embroidery, wash away stabiliser. Bookmark the permalink. This is just beautiful. I will look forward to getting them and making them. Very beautiful, Love them. I would love to try them. I would love to have one of the Angel to make for my Home Thank you. Thank you. The angels are lovely. If I can try them I will do so, Thank you. Thank you. They are perfect. They are beautiful. You are very talented! This is beautiful. I send an angel to a woman I worked with for 13 yrs and would love to send this as a great surprise. Thanks very much.